Hoping to get C.W. on a new track, I encouraged him to try his hand at something creative, like writing. To my surprise said it was a great idea and he would jump into it with all seven of his feet. Imagine. So I wasn’t surprised to find him occupying my desk, sporting a long beard and white robe, and working over large scrolls of paper. 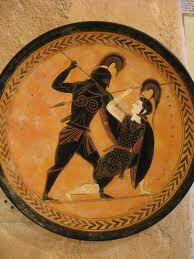 “For The Iliad. Now I’m working on The Odyssey. C.W. often leaves me speechless. This was one of those times. I sank into my seat as Rosy Dawn dipped her cheerful fingers into every unlighted corner of the world.